Riddle me this: When is the truth not the truth? Answer: When I am talking to myself. If you’re thinking that this riddle is not funny, you’re right – but it is true. We are so focused on what we believe is true (and often it is), that we miss what is real. Real in this sense means the deeper truth and real reasons for my choices or outcomes – not the rationalizations that I latch onto to justify my decisions and results. If you’re struggling with this concept, stick with me one more moment as I further illuminate this mindset and potential block. Let’s start with a prime example of how truth got in my way for many years. In 2001, after leaving the law firm that I founded and the legal career that I had chosen as a teenager (after 17 years), I purchased a coaching franchise and began what I expected would be another success. I was going to help business owners improve their businesses by sharing with them what I had learned in building my own business—and I was going to make lots of money doing it. Three years later, the business had failed, but I did not admit that failure for many years. Instead, when talking about my coaching business, I told “blocking stories” – stories you develop (often unconsciously) to protect yourself, which are often filled with some truth, but only enough to keep you stuck or off course. My former partners had failed to pay me my buyout for my ownership in the firm – Again, verifiably true. Here we have three true statements, but they are false truths because they left out the real or most important truth (the true driver for my decision or outcomes). What was that real truth? The main reason for my business failure was me. It was not until a speech I gave in September of 2009 that I for the first time took responsibility for the failure of that business. All of the foregoing stories were true (or mostly true), but the biggest truth was that I was not ready to make that business succeed, and I did not do what needed to be done to create that success. My ego got in the way, and I took the attitude that people would flock to me because I was amazing at what I did. Instead of asking what I needed to do to create success (and then doing it), I asked questions like “Why wouldn’t someone hire me?” Instead of doing all of the little things that create big results, I waited for the phone to ring. I networked and met lots of people, but I never did the things I needed to do to build the business. This was the real truth, but I had covered it up with false truths to make me feel better. Are you beginning to see the insidious nature of these false truths? I have a bonus opportunity at the end of the year, and I want to wait until that bonus is known and paid (Certainly, the opportunity to receive a bonus can be a true reason for not leaving a current job). Well, now we’re down to the deeper truths. While the first three reasons may be true, the deeper truth – the reality – is that what’s really driving her staying put is fear. Even though she claimed that these fears were a minor part of the justification for staying where she is, these so-called minor reasons almost always are the reason. While the other truths seem rational and certainly justify the decision to stay put, the real driver is the fear. Thus, the false truths were masking the reality and deeper truth. Only when we directly confront the reality of our choices and obstacles can we overcome them or consciously choose to make a decision based upon these deeper truths. In most cases, false truths are more comfortable and more socially or professionally acceptable. Thus, there’s less likelihood of being judged by others and by yourself, and the false truths are safe, feel-good rationalizations. Most important, though, the false truths (if not called out) will keep you stuck in your rationalizations and unconscious choices and thereby stuck in the place you say you don’t want to be (personally or professionally). There are two key ways to test your truths. First, rely upon trusted people around you to ask you some basic questions and challenge your reasons to determine if they are really true or merely rationalizations. 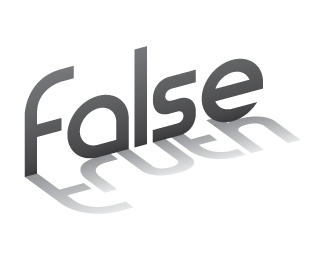 Second, when you find yourself explaining your reasons for any decision or choice (to others or to yourself), be aware enough to ask yourself this follow-up question: Is that really true, or is it a false truth? This question alone can often help you to let go of the false truths and take ownership of your deeper truths, and this ownership is perhaps the only way to make sure that you are deciding and choosing consciously and that you are moving beyond the rationalizations and false truths that will keep you where you are. Riddle Me This: When is my truth the deeper truth? There is no perfect answer or process, but like so many elements of conscious leadership and livingshipTM the deeper truth lies in challenging yourself, opening yourself up to challenges from others and not stopping at the first answer. After all, those pesky false truths are almost always the first answer.